Bollywood superstar Aamir Khan praised his Dangal co-star Sakshi Tanwar. 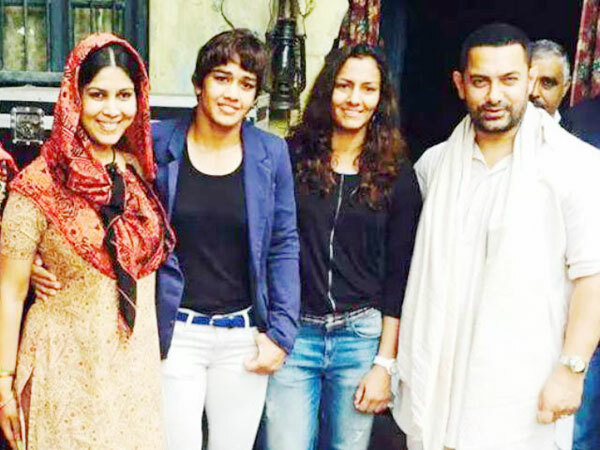 Sakshi plays Aamir’s wife in the wrestling drama, which is slated to release on December 23. The 51-year-old actor said the film’s director Nitesh Tiwari was impressed with Sakshi’s test following which she became a part of the project. “My mother watches television serials and she loves Sakshi. I told Nitesh (Tiwari) to try her (Sakshi for the role of my wife in Dangal). Nitesh liked the test and that’s how she came onboard. She is fantastic and unbelievable. She gives the best shot in just one take,” Aamir told reporters here. “She (Sakshi) is skilled. She feels the emotions while doing the scene. I found it rare in an actor. I was struggling and she was all OK. I took seven-eight takes and she used to do things in one take. She is such a joy to work with,” the Dhoom: 3 actor said. Sakshi became a household name with her performances in daily soaps like Kahani Ghar Ghar Ki and Bade Aache Lagte Hai. The film features Fatima Shaikh as Geeta Phogat and Sanya Malhotra as Babita Kumari, daughters of wrestler Mahavir Singh Phogat, played by Aamir. Zaira Wasim and Suhani Bhatnagar will play younger versions of Geeta and Babita. “It was outstanding working with all four girls. They were unbelievable. These girls are new but were effortless. I was amazed as I am (in the) industry for over 25 years. I am proud of them. These young actors are very focused and talented,” Aamir said. “They learnt wrestling and even get the dialect right. They pushed their limits. Suhani is little darling (and) we all love her. Zaira is very talented young girl. Sania is my favourite (and) my heart goes out to her. I connect more with her emotionally and Fatima is very talented. All four are talented,” he said. Meanwhile the PK star said that in real life he encourages his daughter Ira. “Ira is interested in sports and painting. Both Reena and I and also Kiran encourage our kids to do what makes them happy and learn about things they are interested in,” he said.